The American Prize is honored to announce the winner and runners-up in the college/university division of The American Prize in Wind Ensemble/Concert Band Performance, 2014. Congratulations! 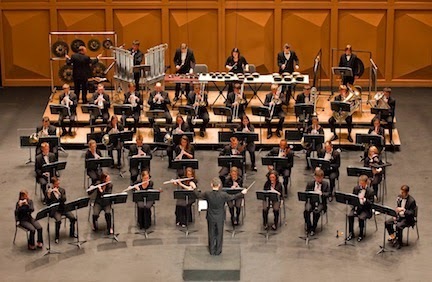 The USC Wind Ensemble is the premier wind band at the University of South Carolina. In addition to its annual concert season in the Koger Center for the Arts in Columbia, recent activities of the ensemble include a 2012 tour of the People’s Republic of China that consisted of 7 sold-out performances in 6 cities. In addition the ensemble was featured at the 2014 American Bandmasters Association National Conference, the 2013 College Band Directors National Association National Conference, and the 2012 South Carolina Music Educators Association Conference. Passionately committed to new music, the ensemble has commissioned and premiered dozens of new works by many of today’s leading composers, and the group recently received a grant to record the world premiere recordings of new works by Joseph Schwantner, William Bolcom and Scott Lindroth for the Naxos label in 2015. Among judges' comments: "this is a first-class performance that I will be visiting again and again." The Illinois State University Wind Symphony is a select group of the finest instrumentalists at Illinois State University, performing representative works from the wind band literature. In addition to campus programs, the Wind Symphony tours regularly. The Wind Symphony has been a featured performing ensemble at the American Bandmasters Association Convention, the Illinois Music Educators Association Conference, the College Band Directors National Association Convention in 1992, 2001, 2005 and 2014, and the 2005 Midwest International Band and Orchestra Clinic. The Wind Symphony is proud to have enjoyed close relationships with the finest composers writing for wind bands, including David Maslanka, Michael Colgrass, Karel Husa, and many others. 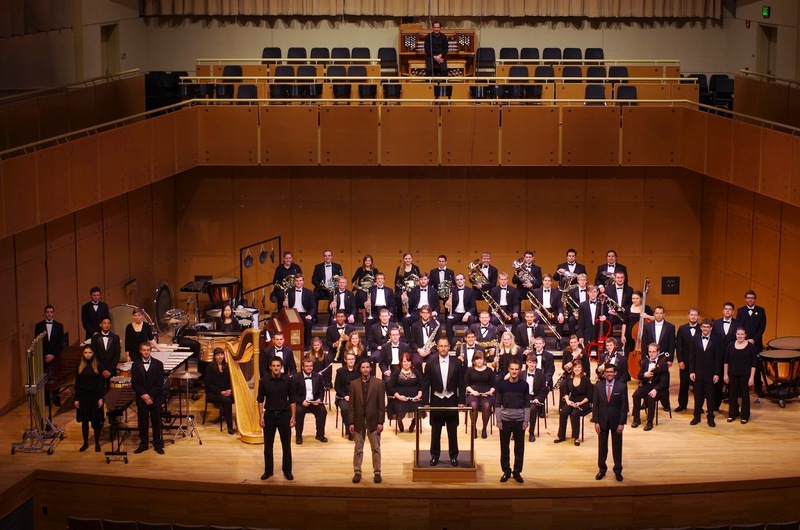 Among judges' comments: "...the players trust their director and place their hands in his skillful care..."
The Ithaca College Wind Ensemble was founded in 1981 and is the premier wind band at the School of Music. Following in the rich tradition of Patrick Conway and Walter Beeler, the ensemble, conducted by Stephen Peterson, presents some eight concerts annually both on and off campus, including such venues as Lincoln Center. 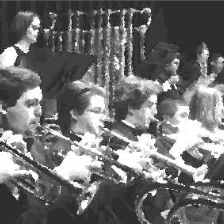 Through a demanding schedule of concerts, tours, and recordings, the ensemble has developed a broad reputation for performing excellence, innovative programming, and commitment to new music. Concert programs include a wide variety of music including wind band classics, chamber works from a variety of historic periods, new commissions, and those newer works that serve to expand the evolving repertoire for the wind ensemble. 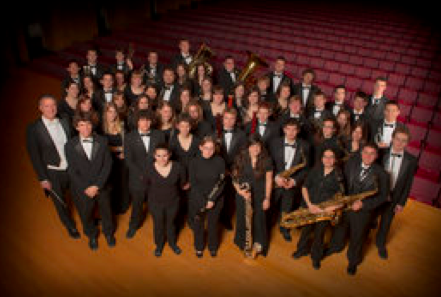 Within the past several years, the wind ensemble has been invited to perform at the national conventions of the country’s two most distinguished band organizations; The American Bandmaster’s Association and the College Band Directors National Association. Guest conductors and composers from around the globe who have worked with the ensemble include Samuel Adler, David Amran, Frank Battisti, Warren Benson, Michael Colburn, Michael Colgrass, John Corigliano, Viet Cuong, Richard Danielpour, Michael Daugherty, David Dzubay, Lukas Foss, Arnald Gabriel, John Harbison, Karel Husa, Libby Larsen, Timothy Mahr, John Mackey, David Maslanka, Ron Nelson, Larry Rachleff, Timothy Reynish, H. Robert Reynolds, Gunther Schuller, Joseph Schwanter, Roberto Sierra, Carl St. Clair, Richard Strange, Steven Stucky, Frank Ticheli, John Whitwell, and Dana Wilson. Among judges' comments: "The Milhaud was polished and brilliant, and was indeed a highlight for this band."